Monrovia Unified celebrated its Class of 2018 with commencement ceremonies on June 5 for Canyon Oaks and Mountain Park high schools and on June 6 for Monrovia High School. Monrovia High valedictorian Kemyl Tadeo, who earned a 4.65 GPA, will study mechanical engineering at California State University, Los Angeles. Salutatorian Rebecca De La O, who earned a 4.6 GPA, will major in math at UCLA. 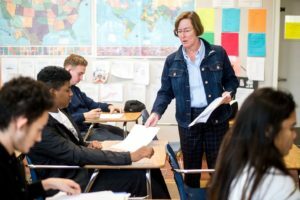 Monrovia High, Santa Fe Computer Science Magnet and Plymouth Elementary have been named to the 2017-18 California Honor Roll in recognition of their performance in math and English language arts (ELA) on state standardized tests. The honor is awarded by the Educational Results Partnership (ERP) and sponsored by the Campaign for Businesses and Educational Excellence (CBEE). Students at Monrovia Unified’s Monroe Elementary School will showcase artwork they created during the Los Angeles County Museum of Art’s eight-week enrichment program, After School at the Museum, from 4 to 6 p.m. Wednesday, May 30. The art show will highlight Monrovia Unified’s commitment to arts education. The school is at 303 W. Colorado Blvd., 91016. 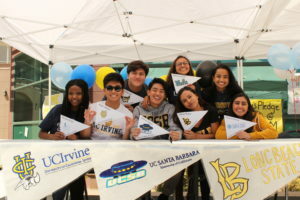 Monrovia High senior Rebecca De La O proudly signed a symbolic letter of commitment to attend the University of California, Los Angeles during the school’s lunchtime series of college signing celebrations, Sign on the Line, from April to May. De La O will study mathematics of computation, a major she discovered that blends her interests in computer science and gaming when she became a member of Monrovia High’s Math and Science Academy (MASA) to explore how she can become a video game programmer. 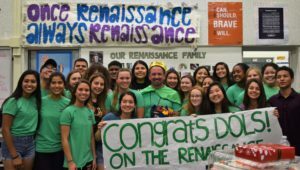 Paul Dols – a 21-year social science teacher and a 10-year Renaissance coordinator at Monrovia High School – will be inducted into the Jostens Renaissance Hall of Fame for cultivating a positive culture on campus. 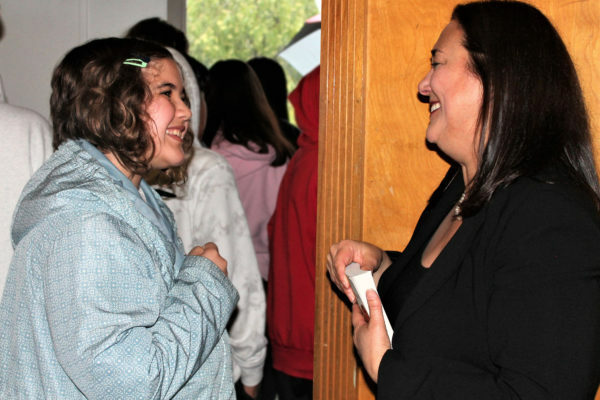 Dols’ induction was announced May 4 in front of a teary-eyed crowd of his Renaissance students, school administrators, board members and District officials. The induction ceremony will take place at the Jostens Renaissance National Conference this July in Florida. 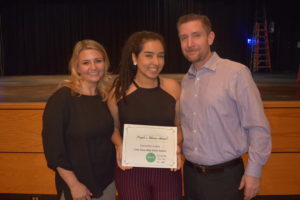 Classical and contemporary melodies filled Monrovia High School’s Taylor Performing Arts Center as more than 600 Monrovia Unified instrumental and vocal music students dazzled in the seventh annual Superstars of Music Showcase. 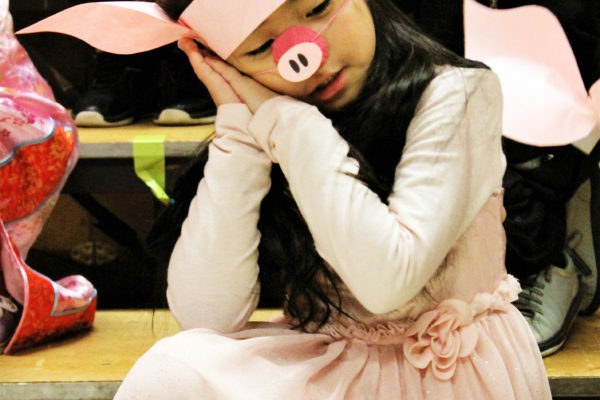 Students from grades two through 12 serenaded parents, educators and community members on May 10 with pieces ranging from Beethoven’s “Ode to Joy” to pop-culture favorites like Howard Shore’s “The Lord of the Rings” score. Monrovia Unified has been selected for a five-year program that promotes using arts education to support English learner instruction. Monrovia will receive an annual grant of $5,000 from the Teaching English Learners through the Arts (TELA) program to train elementary school teachers. 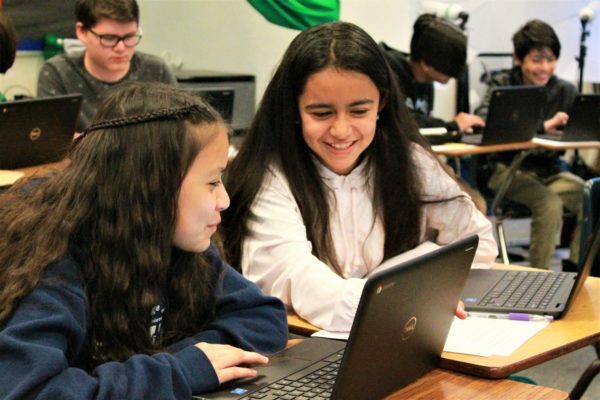 TELA, an effort between the Los Angeles County Office of Education and the L.A. Arts Commission, aims to develop educator skills in language acquisition and support, academic achievement and social and emotional learning for students with limited English skills. Clifton Middle School will host a blood drive from 9 a.m. to 3 p.m. Saturday, June 2 in support of James Speranta, a Monrovia High student athlete who was diagnosed with leukemia mid-March. Donations will go to City of Hope to help Speranta and other leukemia and cancer patients in need.